We understand finding an experienced quality Live-In Carer is not easy, which is why we created www.liveincarejobs.co.uk Established since 2009 we work with the leading recruiters in the industry. Our site connects Live-In Carers with Live-In Care work. We go further than listing your Live-In Carer roles, you will receive relevant applicants as soon as you post your position on our site. With over 25,000 Live-In Carers registered on our site there is simply no better online community for your Live In Care needs. When 24 hour care is needed we understand only the best carers will be considered. 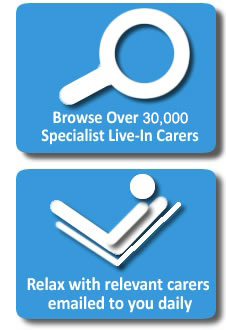 Check out our Live In Carer Profiles Section to see the quality of our audience. Or read our testimonials page to see how well we have done for our clients.. If you are a regular recruiter then look no further than our Basic Package. It’s only £150+ Vat for a month’s usage (No contracts) we hope to prove to you there is simply no better option to optimise your live in recruitment drive. Many of our existing customers renew every month. We like the service as the money we spend is well worth what this site delivers to us. We had a lot of traffic from the mailshot and hired 4 high quality carers. We will continue using your services as it's the best out there. I am very grateful for the support that Crown Home Care has received from Ross at live in care Jobs and the opportunity the website has offered us around recruiting live in carers . The support that we have received has found us excellent candidates which has enabled us to provide the best care we can to our clients. I will continue to use this service . It may help you to know we got three carers from our last ad with you. We were very impressed with the range of people who applied to us through your site. We get the majority of our carers through www.liveincarejobs.co.uk. The website is simple and easy to use. This company are extremely professional, responsive and happy to help, even when tight deadlines are involved. Ross has helped us find a number of high quality candidates to help us support our customers and grow our business. Highly recommended. We have found the service very useful and have hired one or two very decent live-in carers. "Just to let you know the mail shot worked really well for us, we saw a massive increase in applications which is great." Just wanted to send you a quick e-mail to say that I am overwhelmed with the success we have had with regards to recruiting carers - this is all thanks to your brilliant website. The response we get from our advert is truly amazing and has helped us transform the business!!! Your customer support/service is equally as impressive. Enquiries coming in literally by the dozen, taking up much time - I'm unsure if that's a complaint or if I'm providing you with a reference! Anyway there are some good people in there and I have a couple of interviews set up.